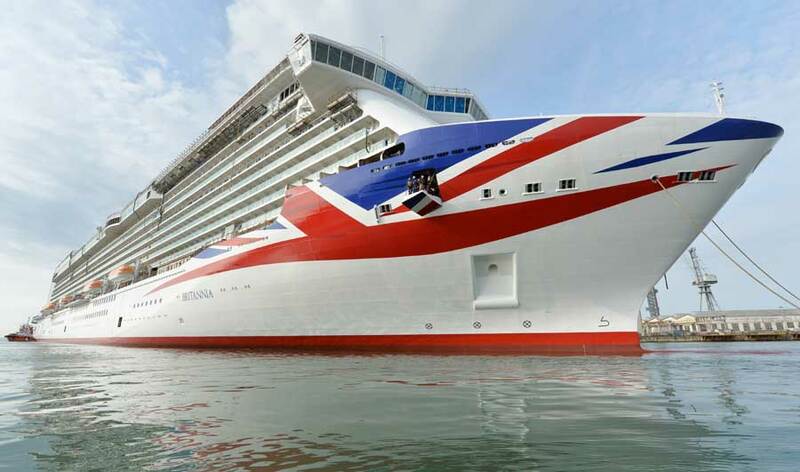 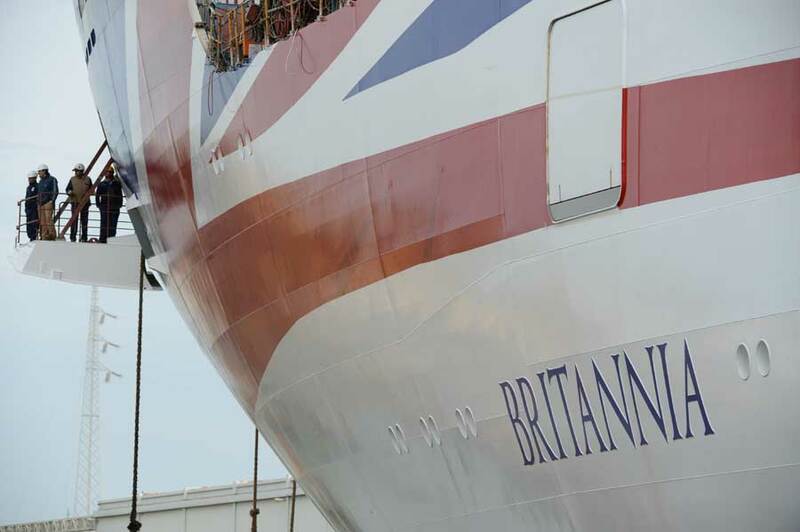 P&O Cruises have released some amazing photos of the P&O Britannia’s new livery on the ships hull. 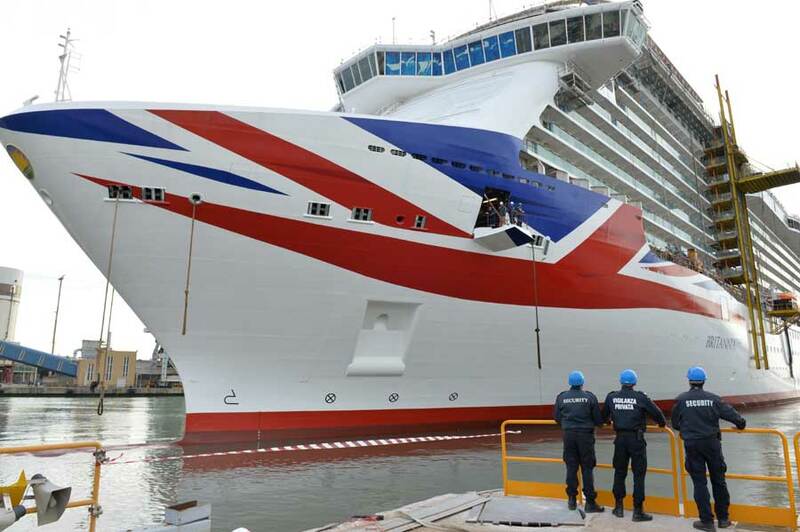 The new artwork was completed on Friday at the Fincantieri shipyard in Malfalcone, Italy. 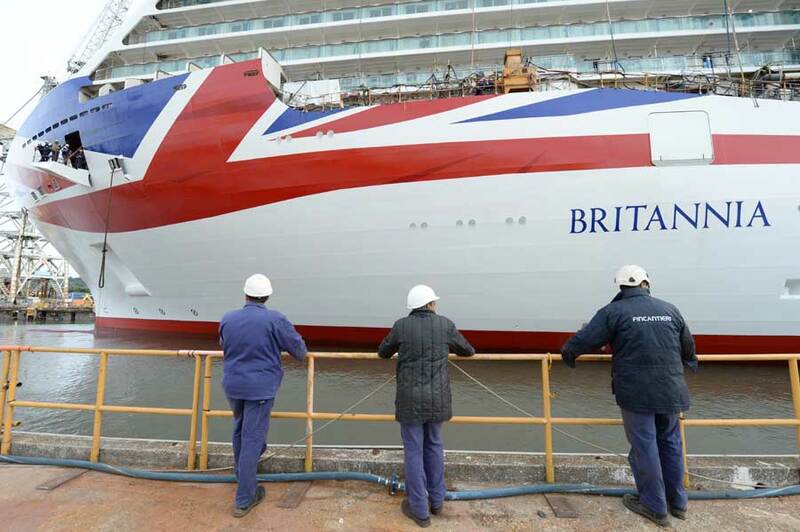 The large 141,000 ton ship also touched water for the first time to commence its next phase in construction which is fitting out all the interior spaces. 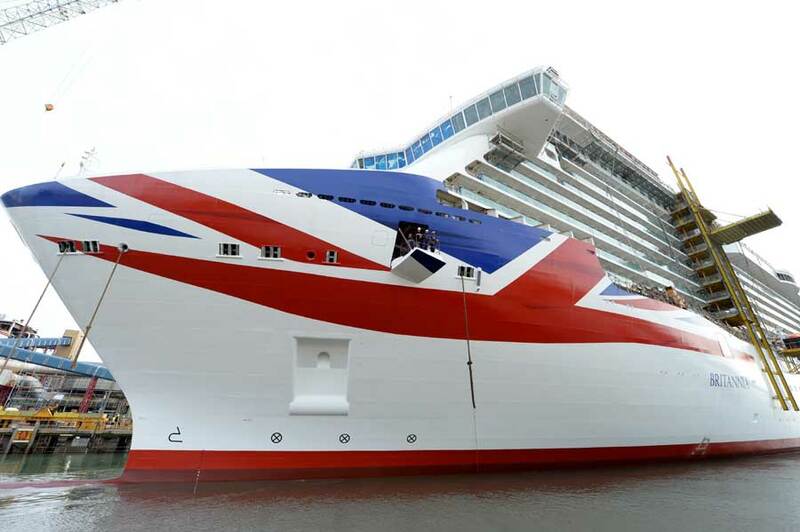 The new hull art on the bow is the world’s largest contemporary version of the Union Flag, which required the following volumes of paint for the newest look to its ship: 280 litres of red paint , 40 litres red for the shadow, 80 litres of blue, 20 litres of blue for the shadow and 160 litres for the big logo of P&O Cruises on the front of the bow. 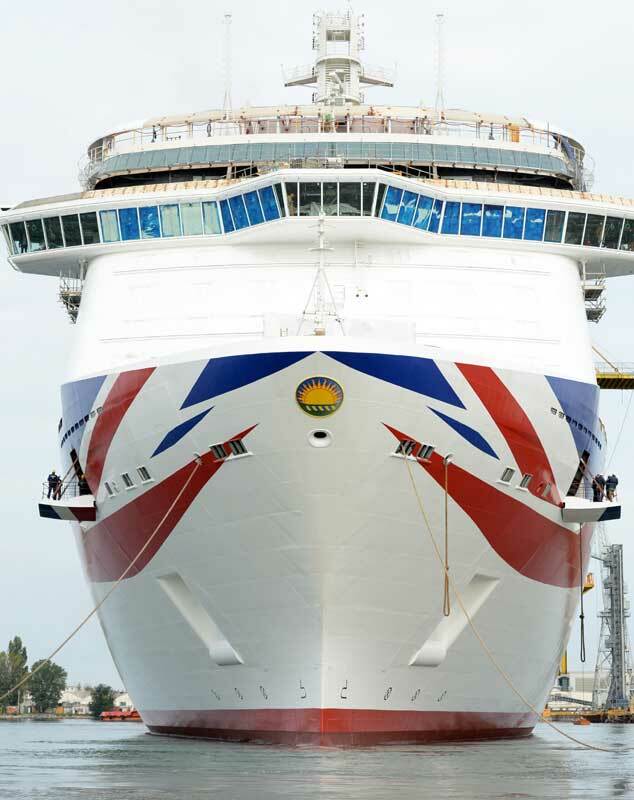 The ships funnels will also be painted in blue with the P&O sun logo that lights up at night. 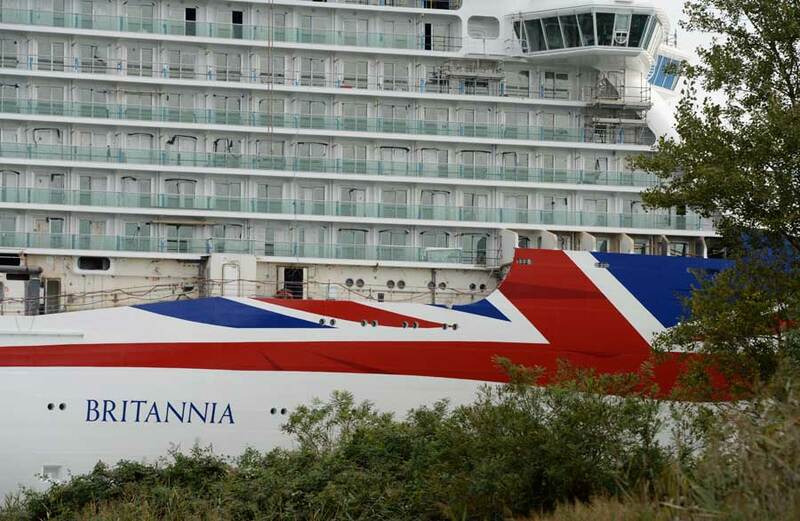 The new look isn’t just for Britannia but is also going fleet wide and will be a great way to showcase British cruising. 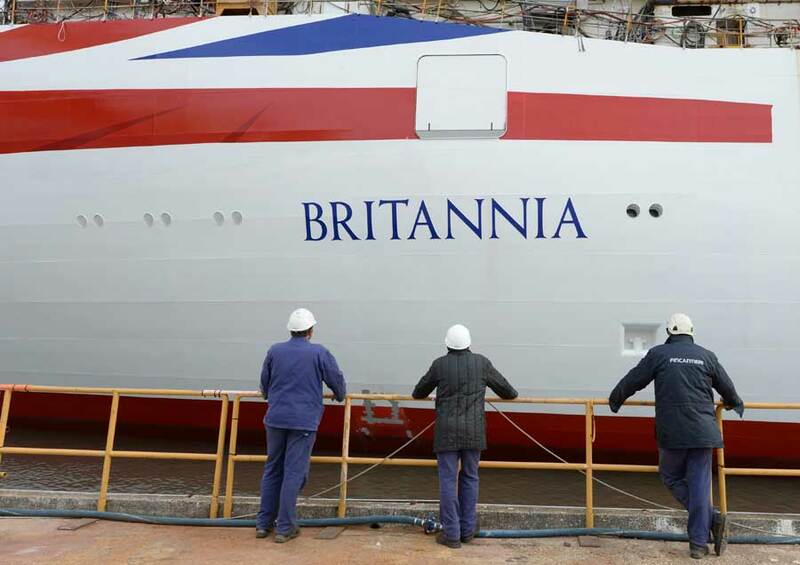 The completion is good timing thanks to Scotland saying NO and staying in the Union just over a week ago. 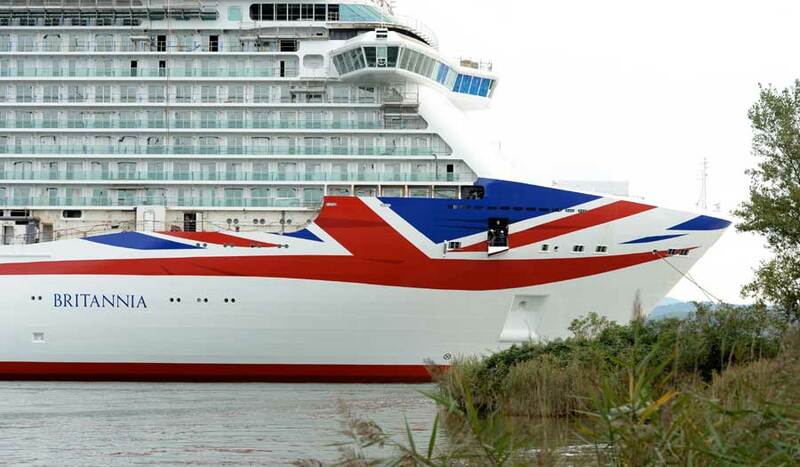 It will be a good way to boost the United Kingdoms image across the world. 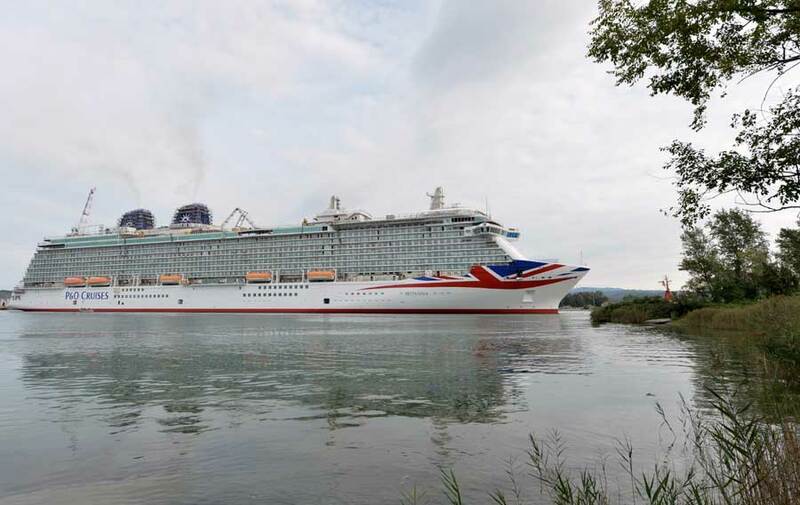 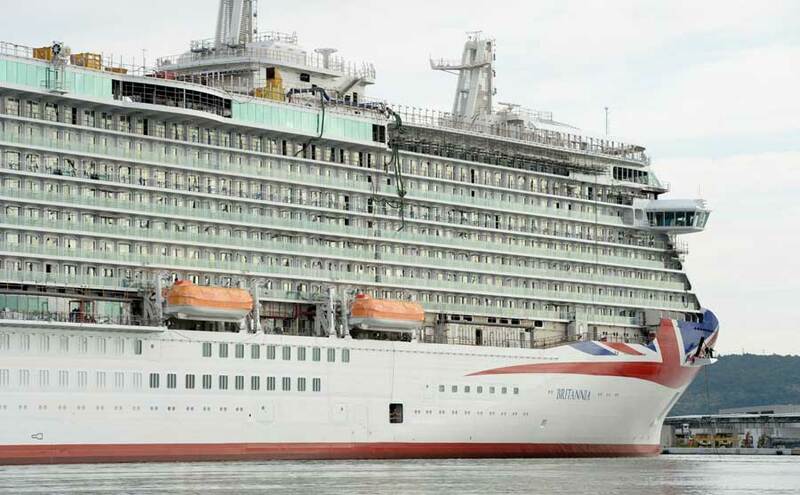 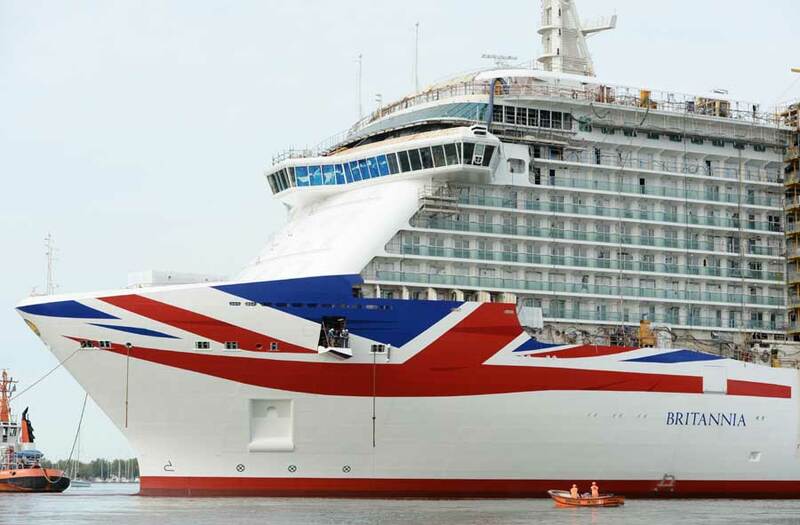 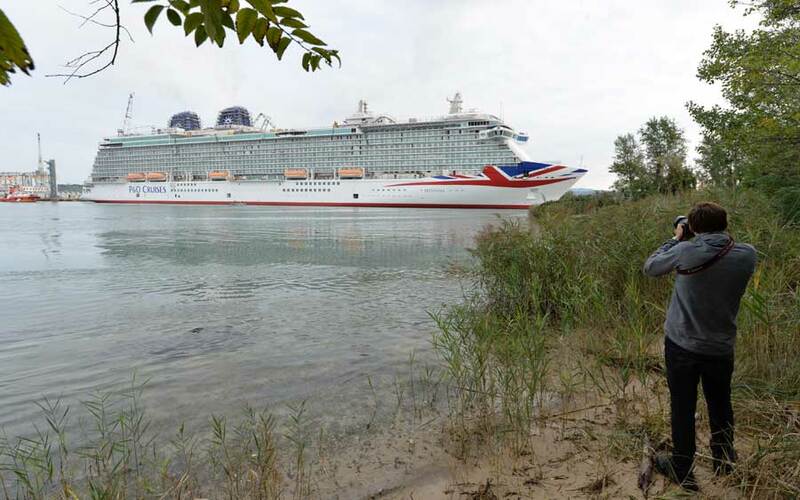 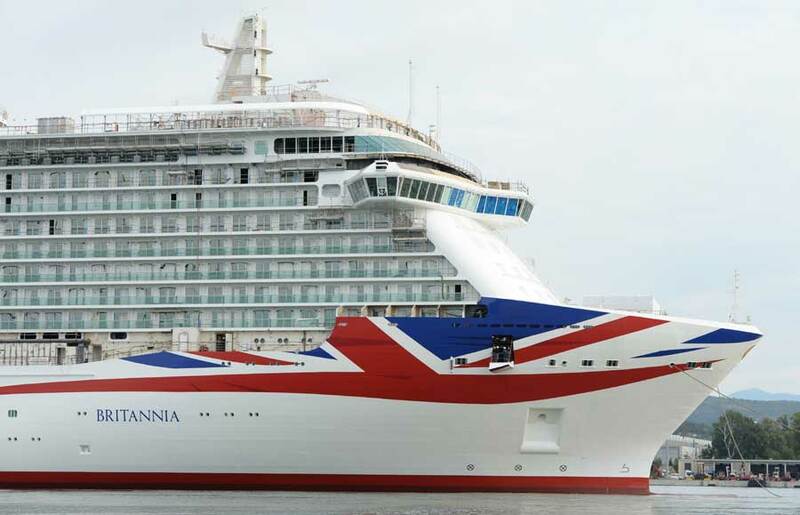 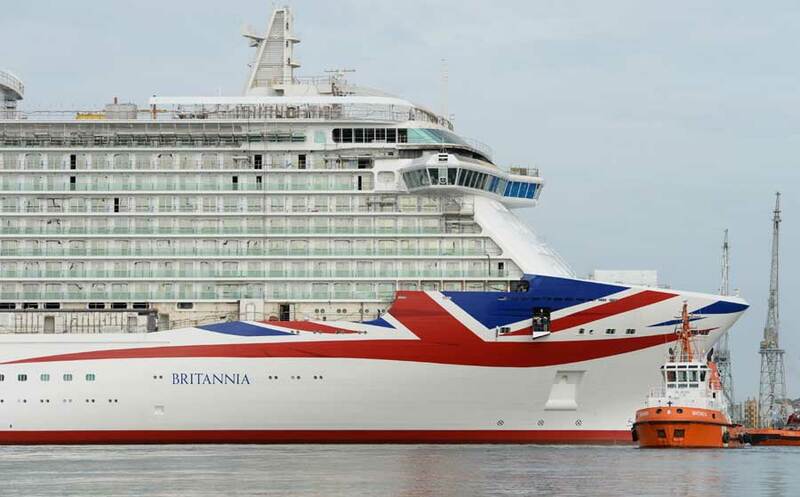 P&O Britannia is being built at an Italian shipyard and many Brits argue that the ship registered in the UK and will fly the British Red Ensign should have been built-in the UK. 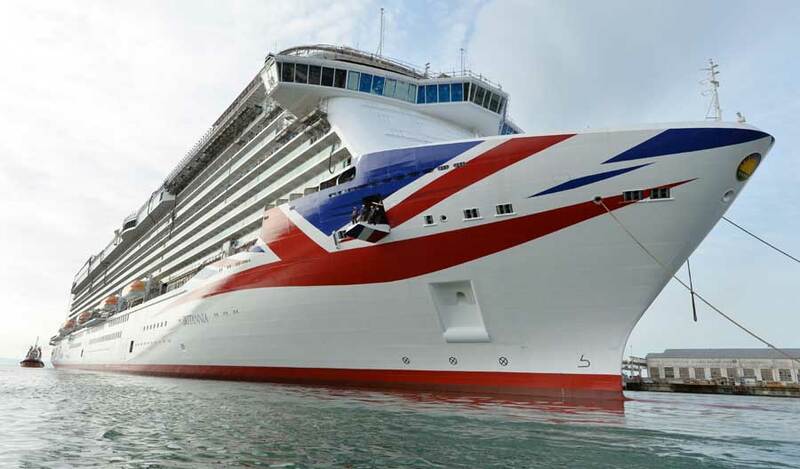 P&O Cruises is owned by Carnival which usually has all of it’s ships built by Fincantieri no matter where the vessel will be sailing from. 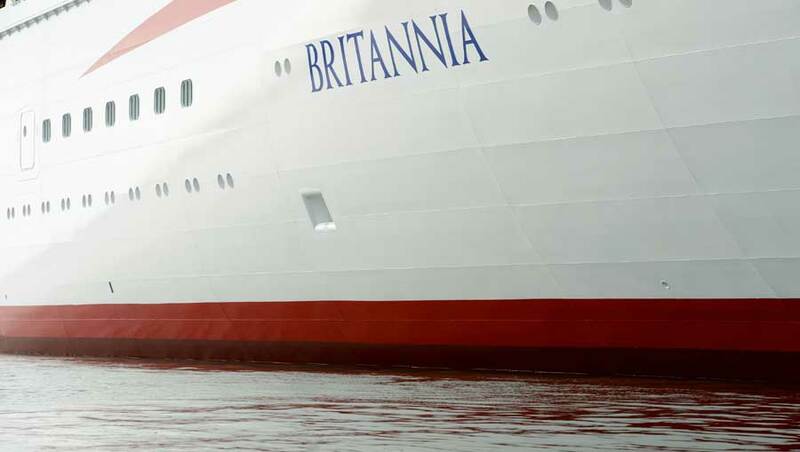 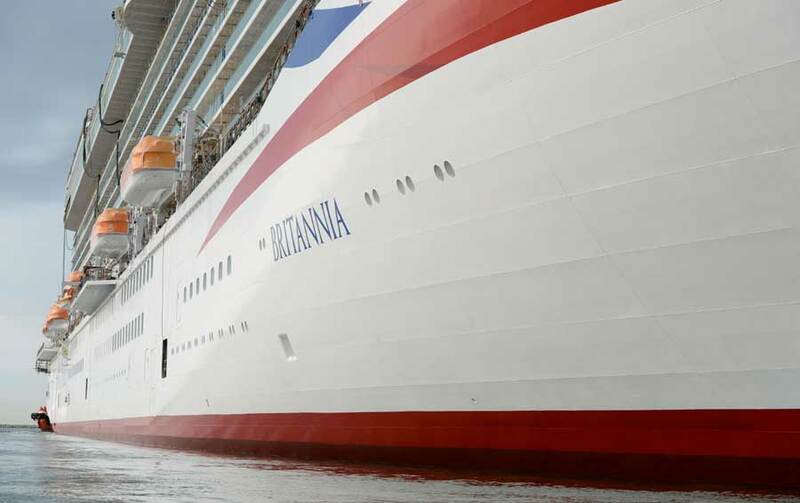 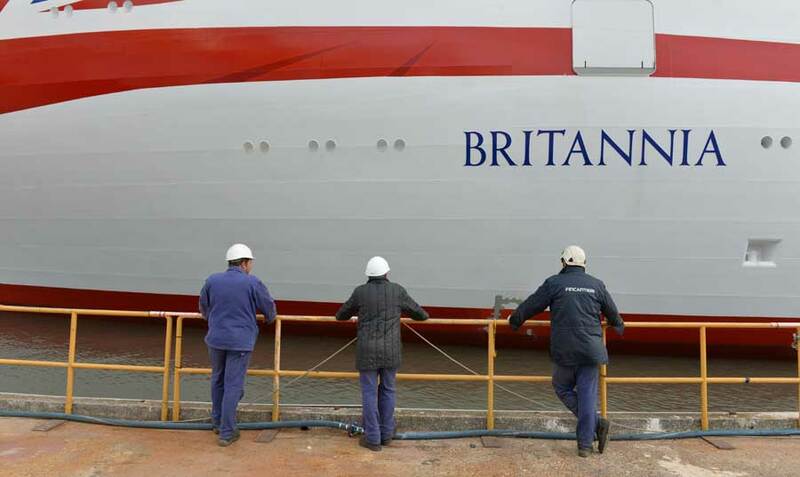 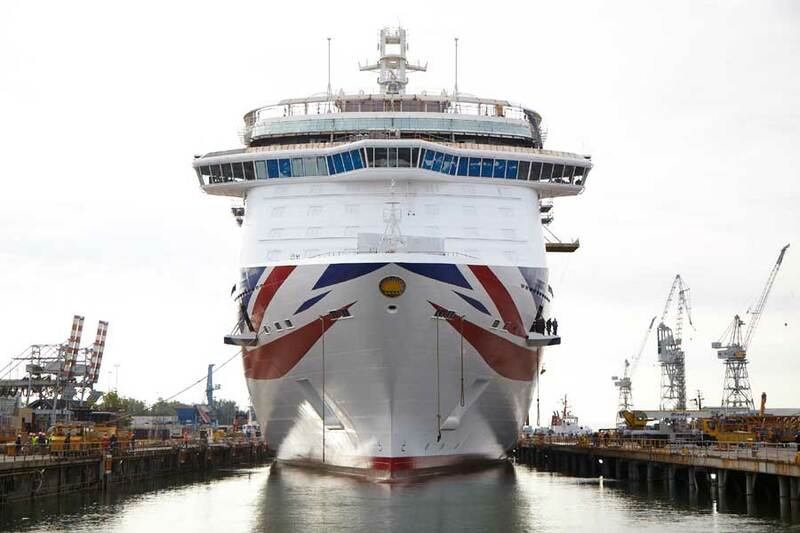 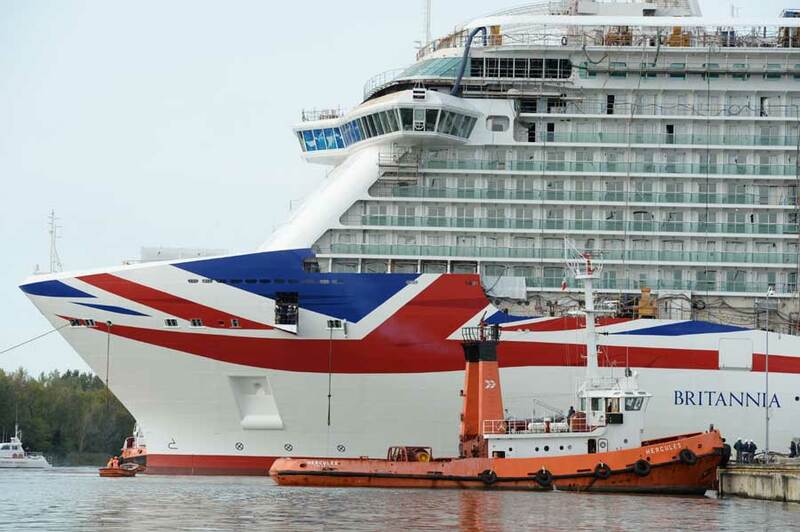 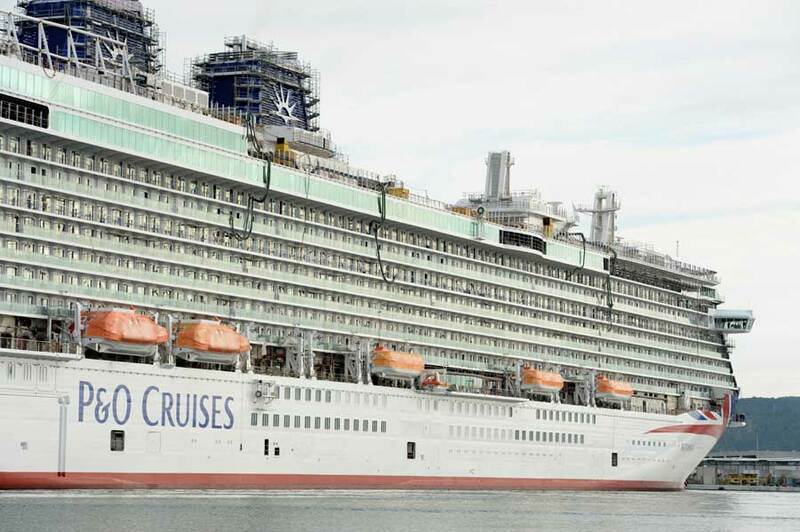 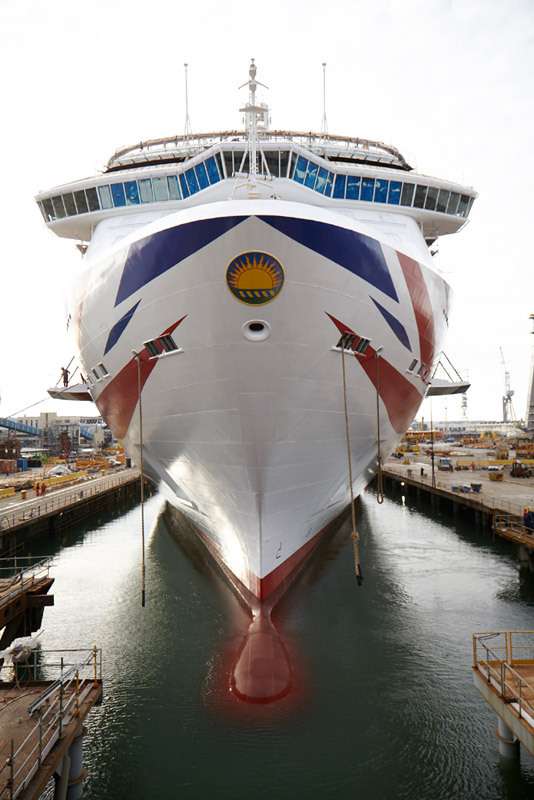 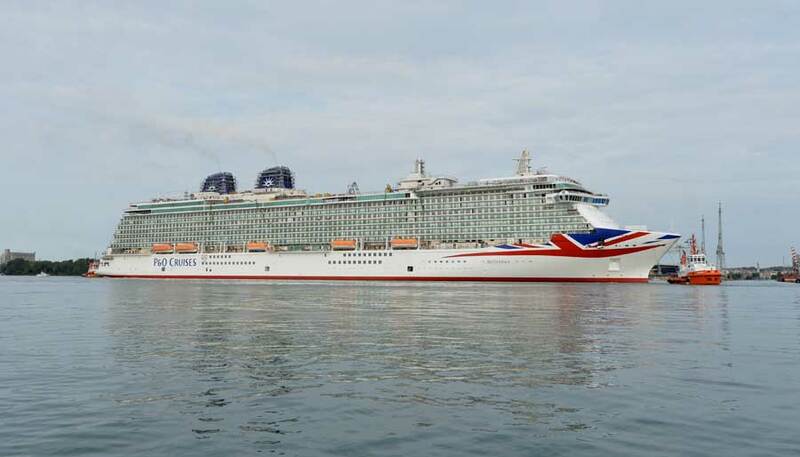 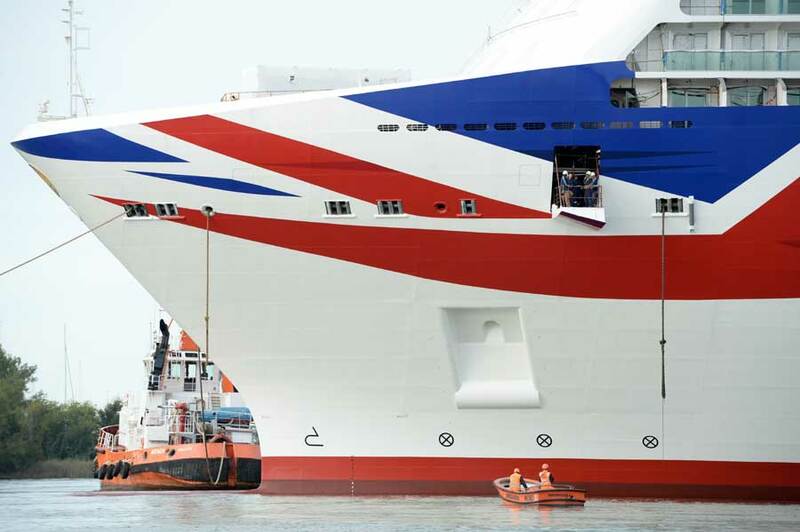 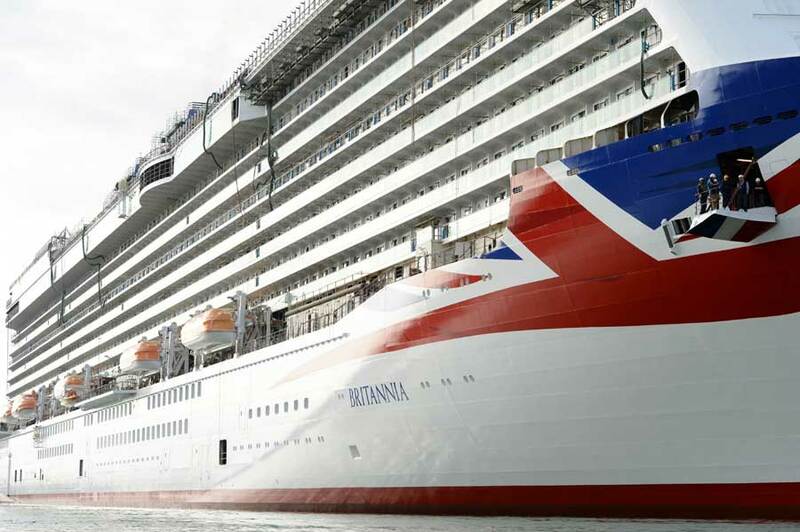 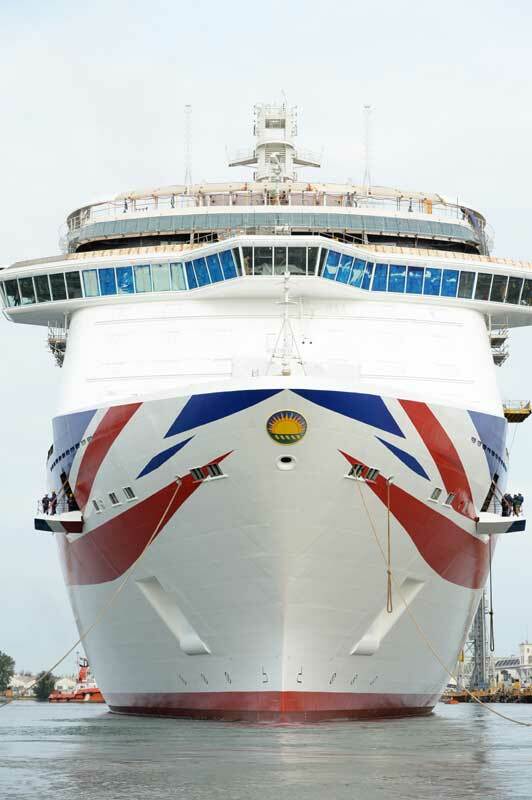 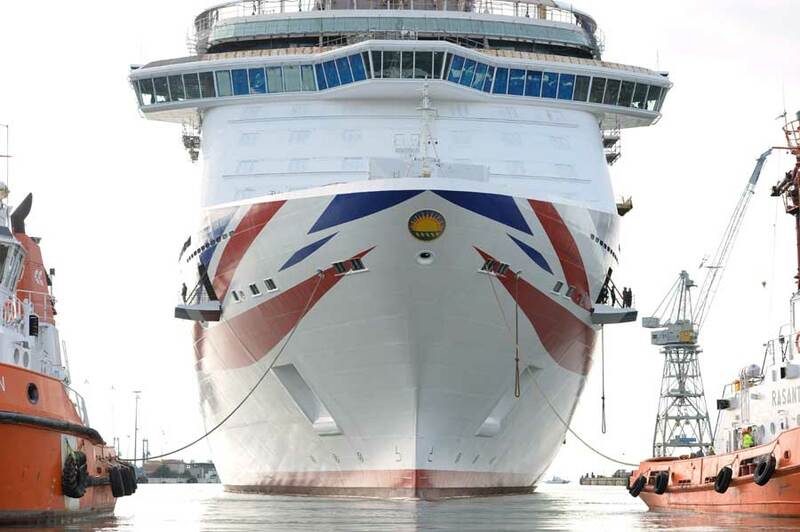 The P&O Britannia is the largest every ship purpose-built for the UK market and will be completed by March 2015. 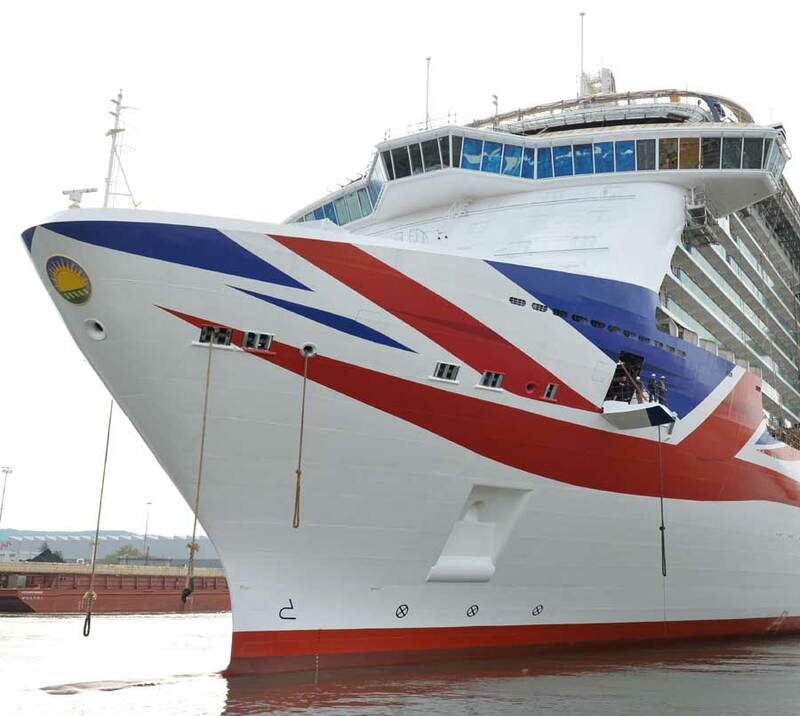 Let us know what you think of the new livery in the comments below.